Hello Stampers! Welcome to another fun challenge over at Tuesday Throwdown. This week we are being sponsored by Lawn Fawn and Lawn Fawn has generously given the DT products to use. I am using this beautiful stamp set called Summertime Charm. This week's challenge theme is "Texture". I stamped all the images and fussy cut them all. I used 3-D foam tape to adhere them to the embossed white cardstock. I also added some texture by stitching along the patterned papers and I used a Spellbinder's Nestabilities die to create the corners by cutting the scalloped square in half on the diagonal and trimming the excess off. I colored the canning lid with two shades of grey Copic markers and placed some pearls in the flower center to finish off my card. Please head on over to the TT blog for more beautiful DT inspirations and win a fun prize from Lawn Fawn. This is soooo pretty Kim. Love the bright flowers. Oooo, loving this one, Kim! 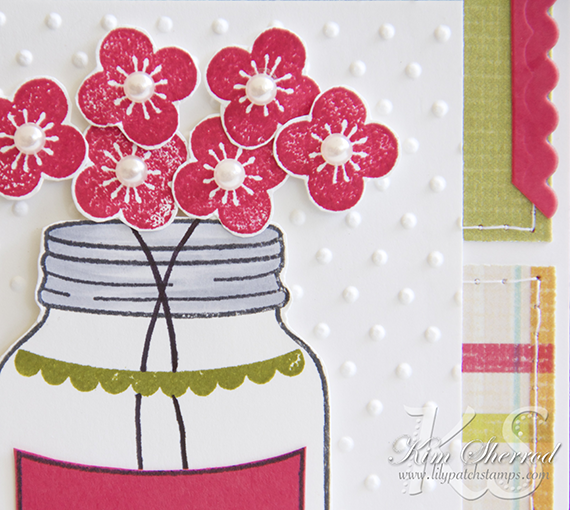 Great job with the mason jar and I love how you added the pearls to each of the flowers. Great papers and color combo. Your fussy-cutting is awesome! I love the colors and your wonderful stitching. Very pretty card! Such a lovely card! Like the papers and that the flowers pop! Thank you for sharing and joining us at ABC Challenge! I really love all the fun things on this card, esp. the stitching and fun corners. Wonderful! Your card caught my eye over in the Lawnscaping Gallery and I wanted to come visit and see more! This is such a soft and BEAUTIFUL card - the details are perfect and this card really shines!! I really enjoyed visiting your blog and I would love it if you popped over for a visit to my blog at daisiesgirl.com!! I have a giveaway going on right now! This is so very soft and pretty! !